On select Royal Caribbean some kids can spend part of their cruise learning to swim (better) with some new swim lessons available for booking in the Cruise Planner. 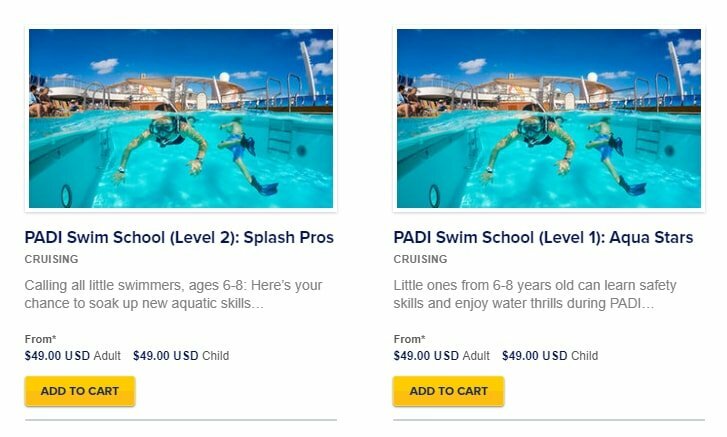 On Harmony of the Seas, two shore excursions listed under the Cruising location offer two PADI Swim School options, for level 1 and level 2. A team of professionals teaches beginning stroke techniques and more to little swimmers ages 6-8 and cost $49 per child. Up to 6 children can attend the class per swim instructor. Little ones from 6-8 years old can learn safety skills and enjoy water thrills during PADI Swim School’s Aqua Stars course. Within the safe hands of a friendly and highly qualified team of professional instructors, young swimmers can get a feel for the water while learning resting positions and forward movement techniques in a small-group setting. Before the lesson, swimmers will be assessed to ensure they can jump into the pool, completely submerge, recover for air and return to the pool’s wall. They will then learn how to tread water, float, swim, rest and breathe properly. After successfully rolling over to rest and breathe, they’ll be taught side breathing and the survival float. The shallow waters of your ship’s pool is the ideal space for new swimmers to learn the basics — all while having some splish-splash aquatic fun. At course’s end young swimmers will know how to float, tread water, swim, and rollover to breathe. Calling all little swimmers, ages 6-8: Here’s your chance to soak up new aquatic skills with PADI Swim School instructors during our Splash Pros course. Enjoy an interactive in-water swimming lesson amid the safe hands of professional trainers and the shallow waters of your ship’s onboard pool. For this small-group, intermediate-level lesson, your instructor will first evaluate your skills to ensure you can jump into the pool, completely submerge and swim at least 15 feet. Then learn how to properly reach, pull and roll to the side for rest and to catch your breathe. You’ll get a feel for the freestyle and backstroke while focusing on maintaining correct techniques for swimming short distances. Not only will you build confidence in the water, but you’ll also have tons of fun along the way. At the end of the lesson young swimmers will know how to freestyle and backstroke around the water. If your kids are old enough for the classes, is this something you would consider? Share your thoughts in the comments below.